No one likes proofreading. It’s boring, it’s the last you want to do before hitting the ‘publish’ button. But it’s the last thing you should do. It’s still a vitally important component of publishing online content because it speaks volumes about you as a writer. You’ve finished writing your blog, or news article for a website, or whatever, ready to lean back in your chair feeling satisfied. Maybe even a little smug. Because you know it’s a good read. You’re about publish it, ready to lean back even further and light up that big fat cigar (metaphorical or otherwise). But wait. Have you proofread it? You may have skimmed over it, given it a cursory glance. But the chances are you haven’t even given it a second’s thought. Oh well, publish it anyway. And there it is, out there for all to see. And while you’re oblivious to the typos, spelling mistakes and grammatical errors in your work, your reader isn’t. Unfortunately, proofreading is something that is being by-passed, over-looked and neglected in favour of getting that ‘publish’ button pushed as quickly as possible. And it’s a shame, because your content says so much about you, whether it’s the subject matter, the style in which it’s written or indeed the ‘smaller details’ like spelling and grammar. It’s easy to think proofreading doesn’t matter – but it really does. It’s obvious, but I’ll say it anyway. Bad spelling can be embarrassing. There should be no excuses. You’ve got Spell Check, so use it. But don’t rely on it 100%, because even that can miss things. A mis-spelled word, especially if it’s the wrong word, can say a lot about you. You really should know the difference between “its” and “it’s” and “your” and “you’re”. Again, what does it say about you as a writer if you don’t? Bad grammar will, again, make you look lazy, and it could also display a lack of respect for your reader. If they’re confused by what they’re reading – if a sentence doesn’t make sense – they could give up and stop reading altogether. It’s well worth an extra few minutes to make sure your grammar is tickety-boo before you publish. In the old days, barely anything was published without it first being proofread. Newspapers employed people simply to read everything before it hit the presses. Of course, they sometimes missed things. But the fact they were being employed in the first place shows how important it was. Nowadays, with self-publishing the norm, articles and blogs are put out there without being proofread. And sometimes it’s glaringly obvious to see. Even respected publishers such as the BBC are horrendously guilty. The Beeb are supposed to be among the standard-bearers for quality but, all too often, you see content published that contains typos, spelling mistakes, grammatical errors or even incorrect facts. While it’s a slip in standards, it’s more to do with the change in times. For publishers these days, it’s all about getting the clicks first, so news articles are published in haste to get it out in the public domain quicker than a rival. While the author, or maybe even a good, old-fashioned sub-editor, will later revisit the article and tidy it up, too many times that doesn’t happen and it’s left there forever more with all its mistakes screaming out at you. That’s when the favoured adage “never wrong for long” really is a slap in the face. But if you’re writing a blog and publishing it yourself, you’ve really got no excuse not to proofread it. Or, ideally, have someone else do it for you. Some people will say proofreading is not important and it doesn’t matter in this day and age. I wholeheartedly disagree. Maintaining an exemplary standard of content should make you feel good about yourself and the content you’re producing. And you should feel even better when you know someone is reading your content, enjoying it and becoming engaged in it, rather than picking out unnecessary mistakes. For some, it’s those mistakes that will live in their mind. I’ll give you an example from my own personal experience of how one mistake can make an impact. Some time ago, during my days as a journalist working on a newspaper, I covered a local story that had national significance. It was big news. I did a good job, even though I say so myself. I produced several well-written pieces, all to a tight deadline, that captured the right angles and storylines, backed up with quotes that only I had. I was pretty chuffed. Yet, in my haste, I made one teeny-weeny mistake. Instead of writing £110,000, I wrote £11,000. It’s a small error, but it was significant. Now, many people would have read over it and missed that significance (the sub-editor that day did). But others didn’t. Later that day, tired and bleary-eyed, I bumped into someone who approached me about the story (everyone was talking about the event). Expecting him to say, “Great piece in the paper mate”, he just pointed out how I’d got that one piece of information wrong, and almost seemed to glorify in it. He didn’t even talk about the event itself, just that one incorrect fact. Now, his motives for making so much from that one mistake were all his own, and I won’t go into conjecture as to why. For my own part, maybe I took it too personally. After all, it’s just one mistake. It’s all a bit trivial, isn’t it? Why worry about it? I didn’t worry about it, because stuff like that did, occasionally, happen. It’s unfortunate, and part-and-parcel of the job. But I did remember it. I remembered how much of an impact such a little thing can have on the reader and on me. It helped sharpen my own senses when re-reading every word I’d written, which has stayed with me ever since. So, yes, proofreading is important, it does matter. The reader does care. And so should the author. Ideally, you want someone else to proofread your content, because if you do it, you will automatically skip over any mistakes. It’s the way your brain is set up, as brilliantly explained by psychologist Tom Stafford, from the University of Sheffield: “When we’re proofreading our own work, we know the meaning we want to convey. Because we expect that meaning to be there, it’s easier for us to miss when parts (or all) of it are absent. The reason we don’t see our own typos is because what we see on the screen is competing with the version that exists in our heads.” But if you really can’t get someone else to proofread for you, just take a bit of extra time and care to do it thoroughly yourself. Even try reading it on a different platform. Just don’t be so hasty to publish, it could mean a world of difference. Just as an example: How many application letters for jobs get dismissed straight away because the person hasn’t read what they’ve written and included silly mistakes (like spelling their own name wrong – don’t laugh, it happens)? You’re right, plenty. But because we’re writers, we should know better. 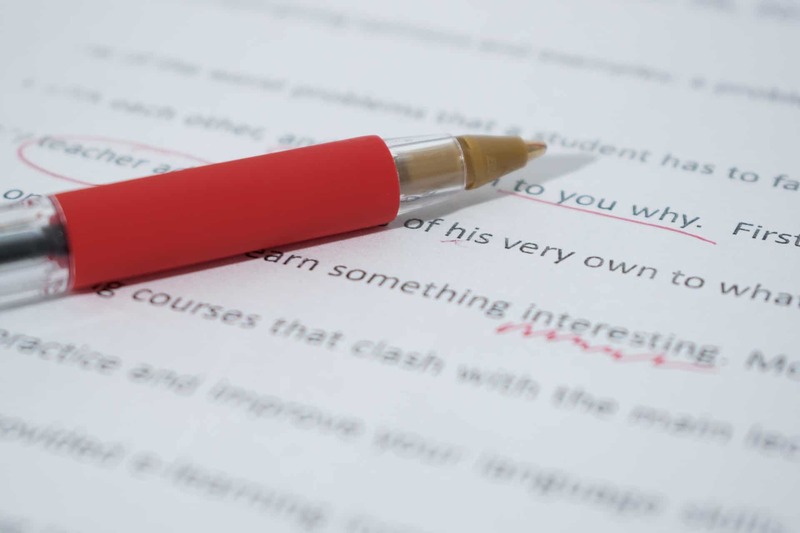 And if you want to be taken seriously by an editor or a publisher, leaving out all the typos and spelling mistakes in your content will mean you’re less likely to be rejected, and more likely to impress. You want your readers to buy into what you’re saying, to trust you. But if you haven’t proofread your content before publishing and there are mistakes, or factual errors, why should they trust what you’re saying? But if your copy is sans mistakes, there’s less chance of it being undermined and more chance the reader is going to hang on to every word you say, fully buying into what you are trying to convey. You’re demonstrating how much of an authority you are on the subject you’re writing about. If you proofread your work, it shows you take pride in it. And that sends out the right message. A simple tip: Treat your work like you would someone else’s. Why should your content be less worthy? That’s right, it shouldn’t. And by getting into the habit of constantly proofreading your work, you’ll start to iron out the little mistakes you make regularly – like how you always get practise and practice mixed up – because you’ll condition yourself to get it right the first time. You’ll get tired of correcting the same mistakes. And you’ll find your proofreading doesn’t take as long. It’s a win-win. If you still really, really don’t want to proofread your content, or you’re stuck with it, send it over to us at hey@likemind.media or give us a call on 01590 228702, and we’ll happily take a look at it for you.